We come to the end of HorrorSoft. And it is a pity that it seems so rushed and a bit unfinished because I really liked both Elviras. The good things in them easily overcome their flaws, at least if you are interested in an horror themed adventure. However, in this game there are simply too many design mistakes, too much repetitiveness, too many dead ends… And even though I ended up the game with the mine, which is the most elaborated level, mostly well designed and interesting, it came after three sections ranging from meh to borderline infuriating. 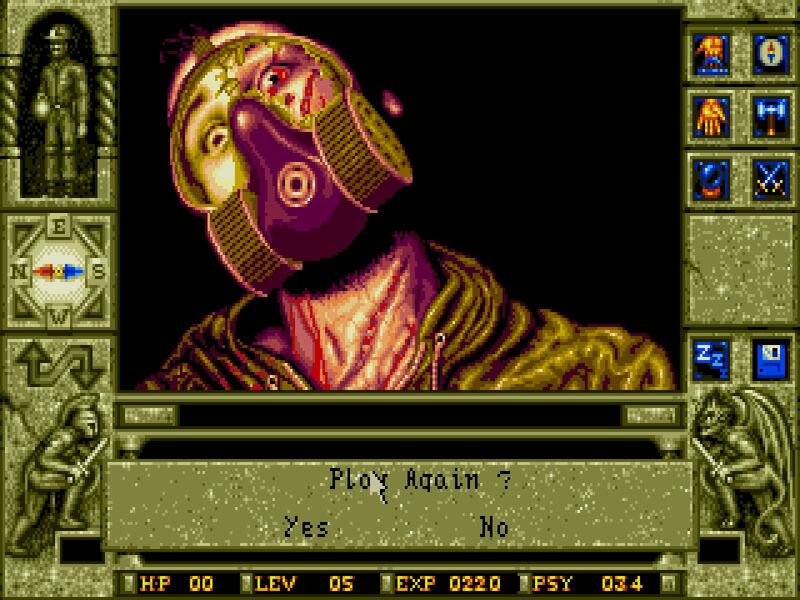 In the end, it didn’t left a good taste, neither as an adventure game nor as an RPG. 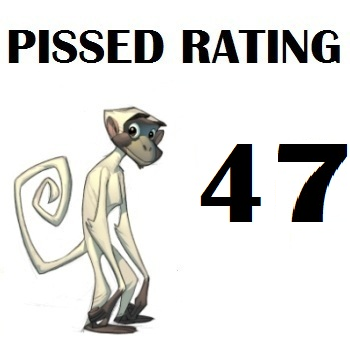 Let’s check its flavour in our PISSED rating. First let me praise the game for the in-game hint system. 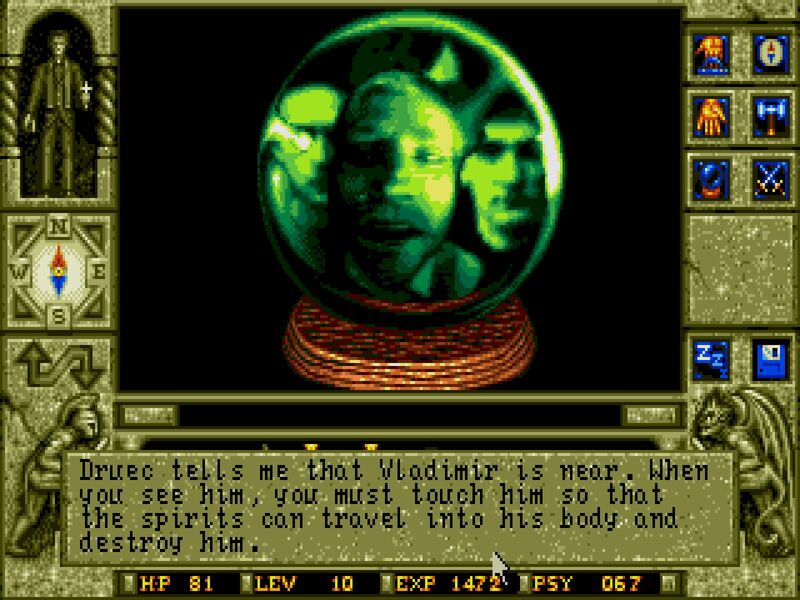 The crystal ball is a welcome addition as it avoids getting stuck in the most nonsensical puzzles, in spite of not having that many of them and although it sometimes doesn’t help with dead ends such as missing the purse next to the dead girl in London. 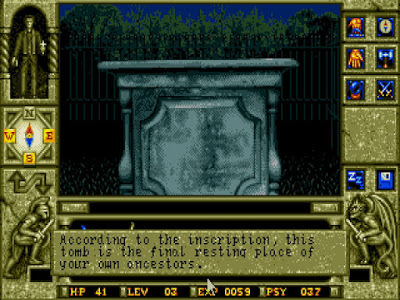 The game even has some memorable puzzles – not groundbreaking, but at least enjoyable – for example, killing the alligator in the pyramid or putting the dog to sleep in London. Oddly enough, they all involved inflicting damage to animals but let’s not dwell too deep into that. The special traps in the pyramid are also a nice addition as they pose a different kind of puzzle that suits well with the theme of the level, which is a play on old adventure movies, and serve as a break from the dungeon crawling experience that is the main game for the most part. However, I have to point out that for the most part the puzzles are based on the worst kind of pixel hunting. Excluding London, the rest of the levels are quite straightforward in what you need to use to solve a puzzle, but the main difficulty relays in finding the needed item, not in forcing you to think about the problem. For example, to get the soldier to blow up the mine, the main challenge is finding the drill equipment. In a completely dark screen. Which is not very remarkable as it is showing you a blank wall for the most part. London is the same, don’t get me wrong, but the sheer amount of objects you can take at least makes you think about which ones are useful for a problem and which ones aren’t. Add to that an excessive amount of backtracking which in some levels can take you quite a long time as the game forces you to get back to the beginning of the level for some location or item. One example of this is the graveyard, where you have to go all the way back to the other side of the level, continuously fighting enemies. But it is not the only one, the same thing happens in the pyramid where you have to keep going up and down through it to solve several puzzles, trying to avoid getting killed by a wire trap, or London, where the game has you going from the north part to the south part in a level that is mostly empty and devoid of any interest. It just smells of padding to be honest. The other main problem I have with the puzzles is that the main focus of the game is avoiding deaths, not solving puzzles. What I mean by that is that the most common difficulty is avoiding traps. And once you learn to avoid a trap, it is simply very uninteresting to have to “solve” another 20 versions of the same trap. And again, solving the traps is a matter of pixel hunting or of finding the right item. This is for the most part the RPG nature of the game showing up, but the problem is that as neither combat nor the trap finding parts are that interesting, this makes the game more boring instead of more exciting. Oh, and I almost forgot, the dead ends in this game are such a waste of time for the player that it is not even fun. I would put them at the level of the yeti puzzle in King Quest V.
I must confess that I was checking my final rating for Elvira II at the time of this writing. 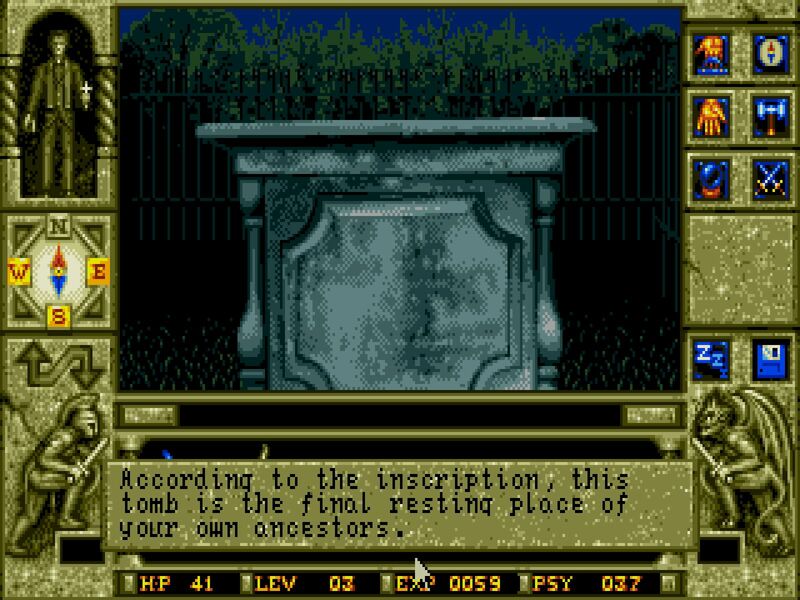 Waxworks is basically Elvira II 2.0, using the same engine with very little improvements and a very similar gimmick with the game overall design, so it just seems fair to compare the rating of both games. And after reading this section, the impression is that this game has gotten worse in both interface and inventory. The game has more non-descriptive items; we no longer have the “room” inventory and hence we can’t drop items or see what is in the room; the use of verbs is inconsistent as sometimes you have to pick and drop to use and at other times you need to use a verb, sometimes both… Add to this that inventory management is a complete joke because you can’t drop anything. If you want to combine an item with another and they don’t appear simultaneously in the same screen of inventory you have to repick both items on the inventory so they appear at the top. Horrible inventory system. To be honest, it is such a pity they decided to drop the spell casting system. It was one of the main charms of both the original Elvira and the revamped version in Elvira II. And don’t get me started with the interface. 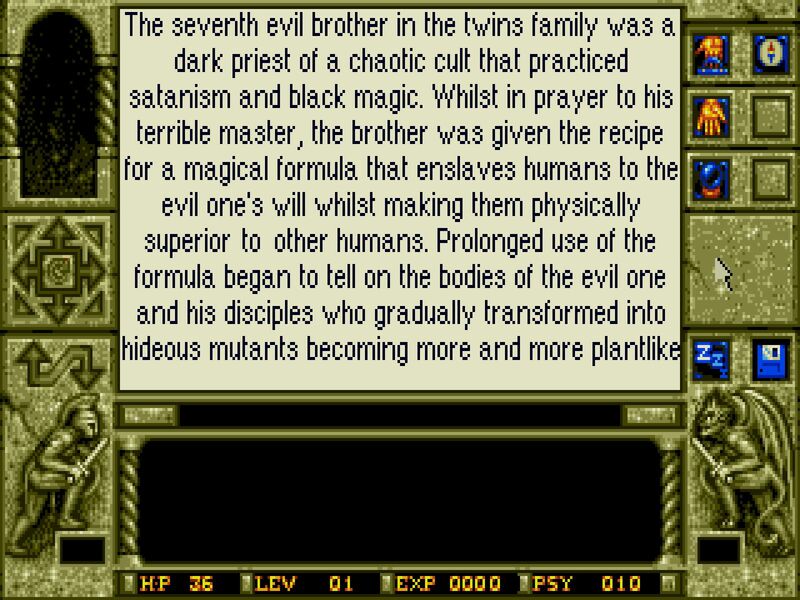 Combat interface is more complicated than in Elvira II, but somehow it has become more a nuisance than an interesting system. It is never clear which attacks are more effective than others. I think there is no difference at all between slashing from the right or from the left, and this only matters in the graveyard. There is only one combat in London and it is just a long boring click fest, in the mine it is just simply better to ignore combat and abuse the sprayer and I didn’t notice any difference between attacks in the pyramid. In fact, the most reliable weapon, the spear, can only thrust. At least the inflicted and received damage is more clear to read, not that it helps but that could count as an improvement. When not in combat, you can just ignore the interface. 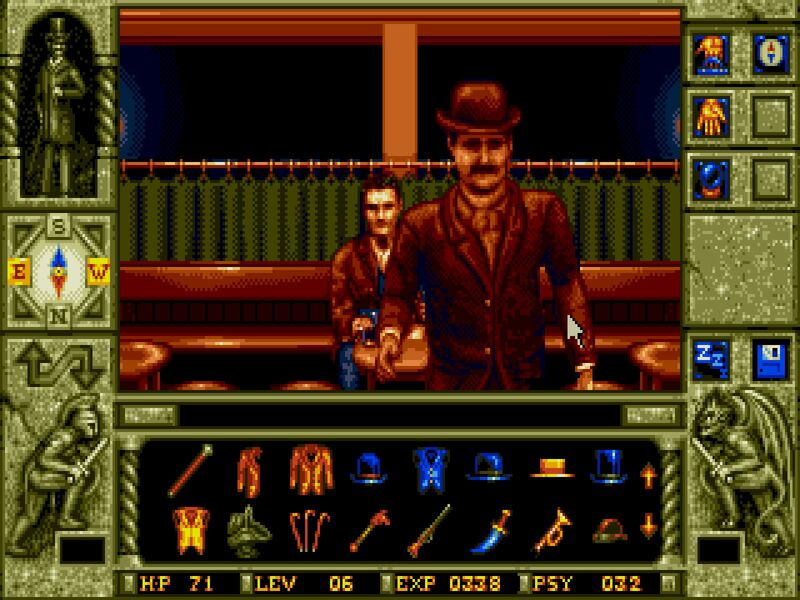 Apart from the inconsistencies I already mentioned regarding use of items, which can be extended to interaction with the environment, the interface shows quite a lot less useful information than in Elvira II. You have the compass, which is nice to draw the maps, but overall the left part of the screen is completely useless. The right part also has a lot of buttons that serve no purpose. It is a simpler game, but the engine was designed for a more complex one, which means now most of the functions are useless and just fill a part of the screen that could have been used for expanding the play screen. Regarding the overall story, this is basically same as Elvira II. I will give the game some points because it at least has a detailed back story, but it is told in the manual and there are some inconsistencies between that prologue and what you find in the game. But if you were to change the twin brother to Elvira, the plot would be basically the same: you need to save Elvira from <evil_entity> and to defeat that entity you need to recover <magical_item> from several different fictional environments (studio set/waxworks) which come to life. It is a backstory that can draw you in, and I think it certainly paid off to hire a writer. Sadly the story is told outside the game, but it is still very nice even in spite of the bad guys being your twins having no relevance to the in-game story. In fact, in the only level where that is remotely relevant you are chased because you were seen next to a dead girl and not because you look like Jack the Ripper. I don’t know why they didn’t start the game with this very image. However, the execution of said overall story is better here. 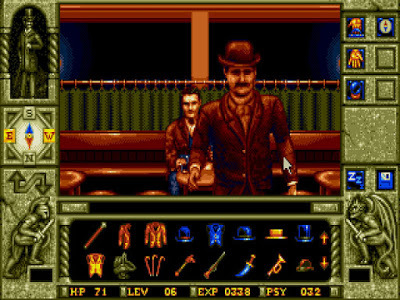 Each individual waxwork is an independent story with its own way of exploring it, which avoids some pitfalls from the previous game where sets had to be related to the studio premise. Granted, some levels are more interesting than others in this regard. For example, in the pyramid or the graveyard the story of the level is not very interesting. The graveyard however is the only level that ties in with the overall story and the main focus in the pyramid is the adventure, not the story. London and the mine are the ones with more story, and I think they make a good job of conveying it. This is no Shakespeare, but at least there is some sense of being part of a particular story in each of those levels and you are not simply dropped there to kill your brother. For example, you have the story of the dead prostitute and her sister in London or the professor and how he managed to stop the evil from spreading from the mine. This is possible thanks to the idea of the waxworks that serve as portals to other times. The main story acts as the glue between otherwise unconnected scenarios, making everything come together in a way that invites you to explore each waxwork, surrounding the whole thing in a layer of mystery. I think this is one of the main draws of the game, if not the most important one. 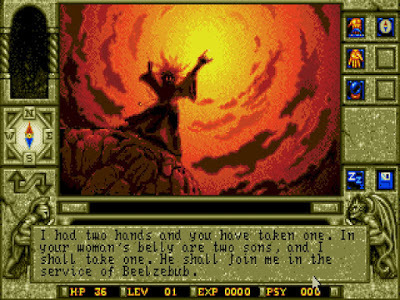 From what I have read from the time, this game was considered superior to Elvira II and I would even dare to say that is remembered more fondly. After some thought I believe this feeling is mostly because of the setting, which to me proves that no matter how flawed your game is, if the setting is interesting and the story doesn’t get in the way, you can leave a good impression on most people, even if the engine doesn’t help with the depiction of Victorian London or a graveyard. This is a surprise for me. Why? Because even though there has been not that much time between Elvira II and this game and considering it is the same engine, the graphics are considerable better. The monster design is quite detailed and gorgeous, with the only problem being that reuse of models gets boring very fast, especially with human enemies that all look the same. But otherwise the graphics are quite nice. In fact, I would even go as far as to say that this game has many of the most visually interesting graphics up to 1992. Even walls look really good. Sadly, animations are a bit clunky, with many of them feeling like missing some frames to reduce costs. Another area not so well crafted is sound. It is pretty unremarkable and repetitive. After having played some 20 hours I can’t say I remember any tune or sound effect, but I do recall thinking very often that I wished the game had a volume control. I would take any of the zombie soldier shouts from Elvira 1 to the completely forgettable sound effects in this game. I said that the engine didn’t help with the depiction of what the levels are supposed to be. But the genius of it is that the game does manage to convey the several feelings they were going for – or at least what I think they were going for. And this is where the game truly shines and perfectly plays on the theme of different periods. While Elvira II always played with the idea of each environment being a studio set, it never really got away with giving an individual personality to each one beyond “this one has more combat, this one more puzzles and this one is in the middle”. I always felt like playing an Elvira game. This game however goes full time travelling with each waxwork removing any link or dependency between them, and the game is better for it. Each level can have its own individual personality, based on movie genres. The two best crafted levels, not only in the atmosphere but also overall design, are the pyramid and the mine. The pyramid really manages to get the feeling of an old pulp adventure movie – the ones that inspired the creation of Indiana Jones. And so there we can find devious traps, easy-to-defeat foes, ancient hieroglyphics and even a lady to rescue. The mine goes for a horror B movie feeling. Fighting against a superior enemy which we can only defeat using our cunning and the help of all the other humans. A horror we can’t kill but that we can defeat and bury for eternity. The other two levels, London and the graveyard, are not so well crafted, and the differences can be felt. It is not that they don’t have a theme, they simply don’t manage to convey it. London because it tries to be a … erm.. well… I would say it tries to be a mystery movie. Maybe one of those Sherlock Holmes ones, with Peter Cushing or Christopher Lee. But it falls short. 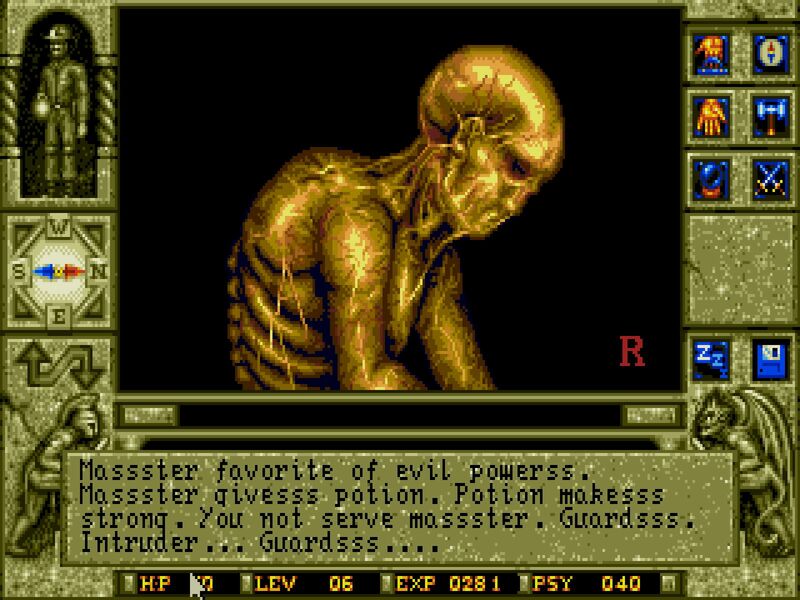 The mystery is not very interesting or well put, and the graphics, while a commendable effort, never really manage to make you forget you are playing a dungeon crawl. Then you have the graveyard. I would guess the designers went for a Night of the Living Dead vibe. 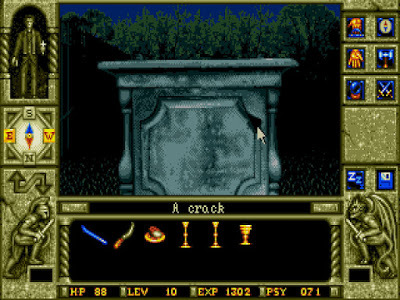 Sadly, there is no level where the “walls” of the dungeon are more obvious than in this one, as crosses and tombstones should not be such an obstacle for navigation. It is also very confusing. Although the constant threat of zombies attacking does impose a sense of urgency, the monsters are so easily defeated and numerous that it ends up being more annoying than thrilling, and the ending with the vampire seems completely random and just an excuse to put a vampire in the game somewhere. I really hate this level. Of course, there are two more locations in the game. 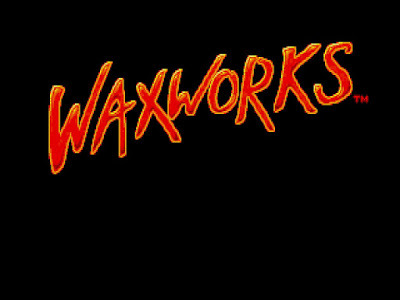 The waxwork gallery and the witch’s waxwork. As a mere hub for entering the other locations, the waxwork is not very interesting, but utilitarian. The witch’s waxwork is more of a rollercoaster than a real level so… None of them counts I guess. Dialogue in this game is mostly exposition. Most of the weight is carried by our uncle Boris, but if he has any personality whatsoever it is never shown. The same can be said about any of the characters in the game. There is little to no difference between talking to a 20th century doctor, a low life thug in Victorian London or the high priest of Anubis cult in ancient Egypt. There is no characterization in general. And the dialogue trees… Well, the best I can say about them is that they exist and make the game feel slightly more interactive. Even if picking a wrong line can pose a real threat, or even end up in a dead end. This laziness in characterization is even worse when talking about item descriptions. The game texts are not very interesting in general. They are sparse and rarely useful, providing no clues about what they could be used for. 4+4+5+6+6+3 divided by 0.6 is 46.66, so 47. 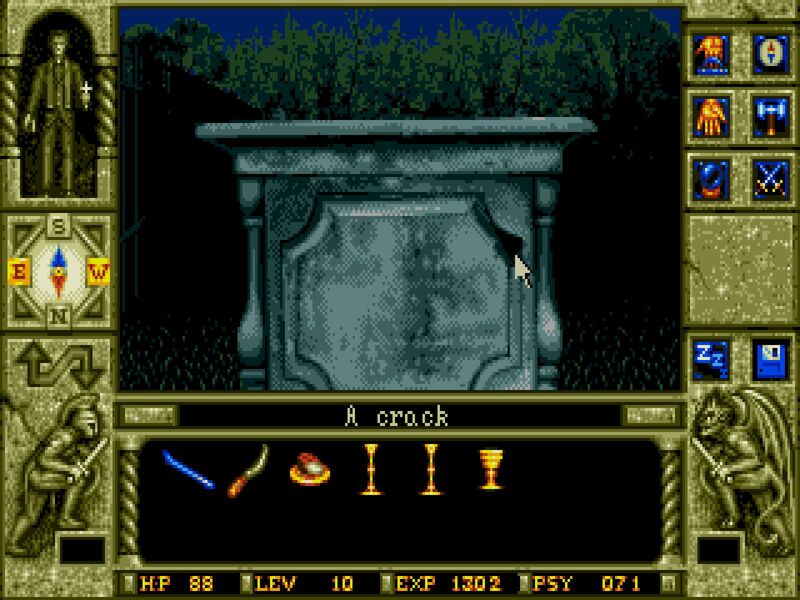 I am actually kind of surprised, because I can say that I enjoyed far more either Spellcasting 301 or Elvira II, and somehow this one got a higher score. Also, I would say that most of my woes with this game are to do with the RPG side of this game and its dullness, which I believe can’t be measured well in PISSED – and by that I mean punish of course. In the end this is a very mediocre game, neither a good RPG nor a good adventure, but with something to appeal to everyone and a very interesting premise and atmosphere. In any case, this is the number I have reached, so deal with it, as TBD did. We must also applaud ShaddamIV and Agrivar as they got the closest to the number of deaths. Congratulations to the winners! 10 CAPs for Lisa H.